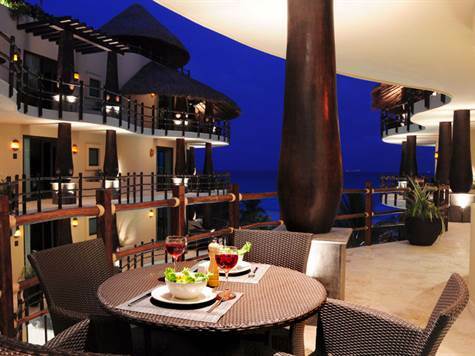 Beachfront, Playa del Carmen - Located in the Premier Zone of Playa del Carmen is the new El Taj Oceanfront Condominiums. Ideally located between the Caribbean Ocean and 5th Ave., you can enjoy the sounds of the ocean waves with the convenience of the best restaurants, nightlife and shopping, all within easy walking distance. El Taj Oceanfront, designed by one of Mexico's premier architects and completed in March 2010, is located directly on the newly restored beaches of Playa del Carmen. This exclusive complex has 41 oceanfront condominiums, each with spectacular views. Included is a beach club with a 5 star restaurant, Indigo Beach, right on the premises. El Taj Condominiums provide you with full ownership and individual title. It's an investment that you can enjoy while earning a great income. If you decide to rent your condo, a property management service is provided that is comparable to a four star hotel. A sophisticated electronic reservation system allows you to monitor the status of your unit from the privacy of your home, while knowing that your guests are receiving the benefits of daily maid service, a concierge and friendly staff. 1, 2 and 3 bedroom condominiums are available for sale. Contact Rob@BuyPlaya.com for a full list of prices, specifications and upgrade options. Pictures shown are those of a fully furnished 2 bedroom condominium. Layouts and finishes may vary.